In Bueu, lost in the maritim scenery of the tidel river of Pontevedra, the “Casa Nueva” (New House), is a completely reformed holiday home since june 2006. It is situated in this beautiful fishermen’s village. Its location, at few kilometres of Pontevedra, Vigo, Santiago, Portugal and with Sanxenxo, just in front on the other side of the river, north, gives you the possibility to enjoy without moving a lot, the main tourist, gastronomic and cultural attractions of Galicia. Local activities such as boattrips and golf courses, will make you enjoy a wonderful and complete holiday. The house consists of 2 floors, ground floor and first floor, with an interior staircase to comunicate them. Outside, in front, the house has a roof which protects a round stone table of 1,4 m from where you can enjoy wonderful panoramic views. On the side of the house there is a stone arch with a covered barbeque area. The house is situated on 50 metres above sea level, 350 metres from the beach and town centre. It has a superficial of 2000 m of garden, with a very old oak tree in front of the house. There are views to the bay of BUEU, BELUSO and PONTEVEDRA. The house is completetly furnished and has all facilities, utilities and accessories a house needs (fully-equipped kitchen, bathrooms, bathrooms) Linen an towels are provided. This property is in need of modernisation it has a television which is over 20 years old and there is a really bad musty smell in the place due to a lack of cleaning. We washed the pots and pans before we used them and wiped down all the surfaces with antibacterial which we purchased. The furniture is very uncomfortable and the couch is very badly stained. It is the most basic place we have ever stayed and you have to provide everything yourself, we had to ask for toilet rolls. The owner lives there and has a huge dog which just wanders about and keeps you awake all night and there is no mention of this before you book. It is very high up and a car is essential. The owner also wants cash when you arrive and again no mention of this until you arrive so we had to go to the bank which charges us. Overall it was very disappointing and over priced due to the very poor standards. "A very well equipped and comfortable house with everything required for a relaxing holiday. Beutiful surroundings and people in local beach restaurants etc very friendly and helpful." "Very nice house in a lovely garden with beautiful view. Lots of information on places to visit and very helpful owner." 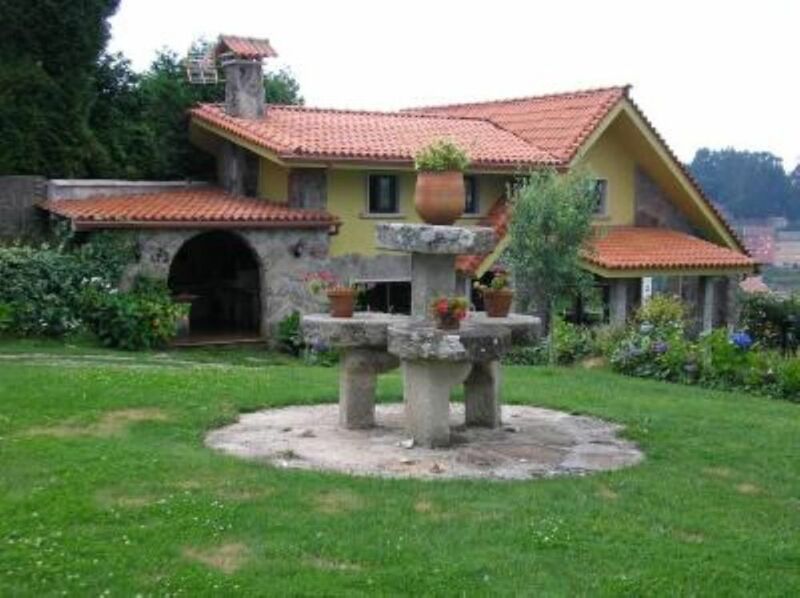 The coastal village of Bueu is situated 19 kilomtres of Pontevedra and 15 kilometres of Vigo. The combination of the Atlantic islands of Galicia are formed by 4 archepilagos: las islas Cíes, las islas Ons y Onza, isla Sálvora, isla de Cortegada and Malveires. This wonderful part of Galicia was declared as a national park in 2002, but only 6 months after that, the disaster of the Prestige destroyed big part of vegetation of these beautiful islands. They are now in full recovery phase, but ecologist dont know when they will be completely healed from the "black disaster". the church of Santa María de Beluso from the XII century, however fully restored after a storm at the end of the XIX century. tarifas decrecientes en función de la duración, tarifa en función del número de personas, fianza pedida, arras/deposito de reserva, entrega de llaves realizada por propietario ausente durante la estanciaietario. LOS PRECIOS PUBLICADOS SON PARA UNA OCUPACION TOTAL DE LA CASA POR DOS PERSONAS, CADA PERSONAS MAS, SUMARA AL PRECIO PUBLICADO +10€/dia.